Ferrite cores (snap on) are snapped over the two (+/-) cables from the solar array module and the two wires hooked to the “string” connecting the micro-inverters together. Suppressing RFI on all wires in and out of the micro-inverters helps to reduce any broadband RFI “noise” generated in the SOURCE switching circuits (typically at 50-200KHz and harmonics thereof). Two ferrite cores are required for each micro-inverter/PV array – one ring for the PV DC cables and a snap on for the micro-inverter cable to the string bus – size to fit the trunk cable with 1 or 2 turns. Application Note for Enphase M190/M215/M240/M250 series Micro-inverters (and similar other brands). 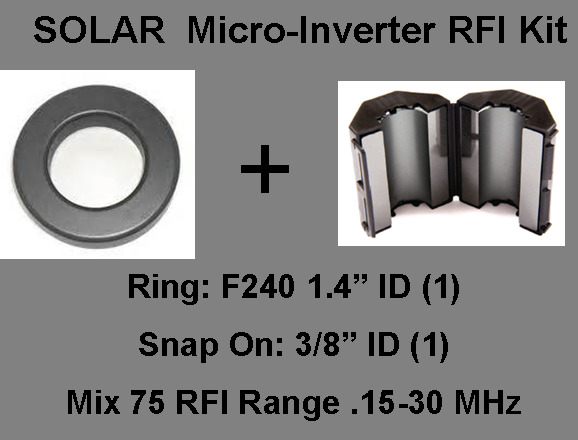 For each PV array/micro-inverter use a RFI-PV-MI filter kit with a ring (ID=1.4″/36MM) ferrite for installation on PV module DC cables to micro-inverter and a snap on (ID=.4″/10mm) filter for the data/trunk cable output of the micro-inverter. At the connection of each junction box and the Engage cable install a RFI-PV-JB filter (ID=1″/26MM) with multiple turns through the center.